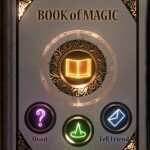 Book Of Magic iPhone App Review. Throughout childhood, I think what amazed me most were circus animals and magic. I was too small to handle lions with a whip, but I could never be too young or too old to perform magic tricks. When I was young, we didn’t have YouTube, so the only place I could learn any magic tricks from TV shows. Right now things have changed, and you can learn magic tricks from a bunch of places online. Since we’re always mobile, what could be more exciting than whipping out your iPhone and learning a new trick in mere minutes. This is where Book Of Magic comes in. 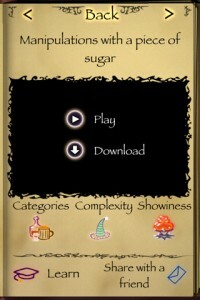 This handy iPhone app contains over 60 unique magic tricks, complete with demo videos and learning instructions, also in easy-to-follow video format. 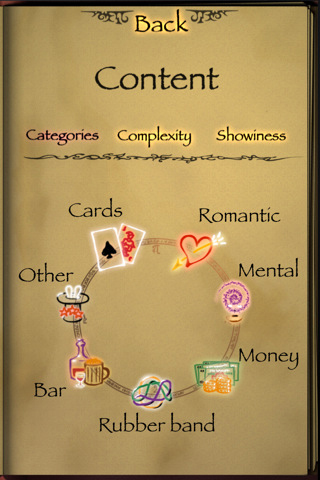 The tricks are categorized according to complexity levels, showiness or categories such as Card tricks, Romantic tricks, Money tricks or Bar tricks. The app does a pretty good job at this, although some tricks tend to be repeated within the app. For example, the Penetrating rubber band trick is filled both under Romantic and Rubber band. Apart from there being a magician and an assistant on stage, there’s no romance involved in the trick. 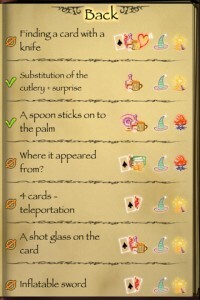 Most of the tricks within the Book Of Magic iPhone app don’t require much preparation or special materials. Obviously, any card trick will require a deck of cards and rubber band tricks one or more rubber bands. Sorry guys, no tricks to make elephants disappear. So go ahead and choose any trick you’d like from the lists, and you’ll be presented with a demo video and an option to learn the trick. The app lacks audio. It’s like watching magic for deaf people. I would have liked some kind of background music playing. When it comes to the graphics, the developers nailed it here. The app gives out a mystical feeling. The transitions between screens complement this. What doesn’t really make a lot of sense from the user’s point of view is the use of the icons for sorting based on complexity and showiness. The other problem with sorting is that it doesn’t work. Every trick has three icons attached. 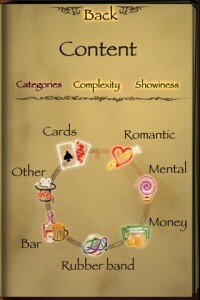 One is for category, one for complexity and one for showiness. The problem is, these icons are not sorting filters. Tapping on any one of them won’t take you to a list of similar tricks from that category. In this case, I would have much rather preferred the use of simple text as opposed to icons I don’t understand what they mean unless I consult a help screen. Dude, where’s my HD space? The app already occupies 45MB of space, but it doesn’t include any of the videos or lesson demos, which you need to download separately. So my question to the developers is, what happens to all the space? With 60 tricks in total, that’s almost 1MB per trick, when all a trick entails is a demo link, a lesson link. Some of the tricks don’t make a great deal of sense. I’ll give you a quick example. In one of the card tricks, the magician asks his assistant to pick any card from the deck, show it to the camera, and put it aside. Then he’ll try to guess the card that was picked by reading the assistant’s pulse. You and I both know that’s not possible, but I must admit the trick really reeled me in. I knew it was a trick, but wanted to know how it was done. So I downloaded the lesson, only to see, to my great disappointment, that the lesson doesn’t fit with the trick. In the trick, the assistant picks up a face-down card, but in the lesson he arranges the card to be face-up when the assistant picks it up. 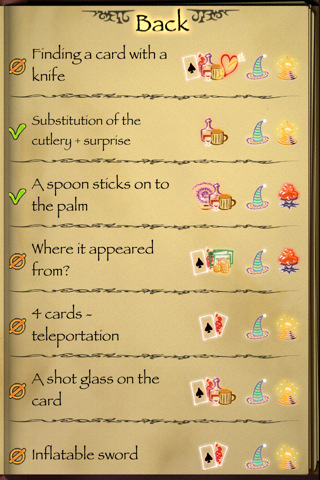 I admit I didn’t have time to go through all 60 tricks. Who would? Depending on your internet connection, you could spend between 2 and 10 minutes downloading one lesson. The app would really work its magic if these lessons were included in the app to begin with. Bottom line, if you have the patience to check out all the tricks, then Book Of Magic is a must-have. The lessons are easy to pick up, the videos are neatly done and the tricks, for the most part, are awesome. But considering that you need to download a 45MB app and then download some more to actually use it, I would say the app feels unfinished and rough, even with the great graphics and simple-to-learn tricks. 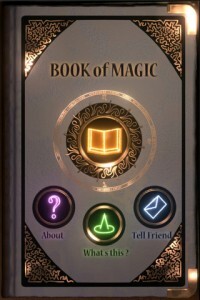 What do you think of Book Of Magic ? Scroll down for our comment section.